Glass curtain wall and options for glass cladding types. Glass curtain wall often provides the appearance of being all glass. Some are glass with metal spandrel covers and some incorporate granite facing panels in the spandrel frames. The glass of vision areas and the glass of spandrels and stone facings are specialty products. 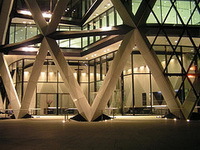 Glass curtain wall is available as float, tinted (heat absorbing), wire glass, patterned and cathedral glass. Float glass may be heat treated to become heat strengthened glass or tempered glass to provide greater resistance to thermal and mechanical stresses. For greater safety, laminated glass is also available. Vision glass curtain wall is usually fabricated from float glass. However, if additional strength or safety is required, then heats strengthened, tempered, laminated or wire glass may be used. Vision glass may be heat absorbing (tinted) or heat reflective (coated). Laminated glass or wire mesh glass are used for impact strength and fire resistance. Check the national fenestration rating council for more info. Vision glass for a glass curtain wall may be single, double or triple glazed. In general, vision glass is clear. It is available in various thicknesses; it is between 6mm to 25mm thick. It is usually assembled into an IGU (integrated glass unit) to provide heat loss (or heat gain) control and better condensation resistance. To describe glass products, the industry has adopted a standard method of surface identification for single, double and laminated glazing units. 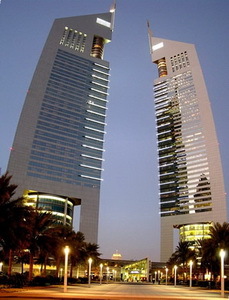 A typical IGU glass curtain wall consists of two layers of glass with a spacer between the panes. The spacer separates the glass panes to a uniform cavity thickness. The spacer bars may be metal (aluminum) or non-metallic (fiberglass). Fiberglass spacers are used to reduce heat loss at the edge of the IGU or to increase the inside edge glass temperature. They are usually filled with a powder that absorbs humidity (molecular sieve or desiccant) and the residual moisture in the cavity air between the two layers of glass following its fabrication. In general the powder is placed in all four bars and it lowers the dew point temperature of the IGU cavity air to -60 degree C or less. Spandrel glass is often a single layer of heat-strengthened glass with a metallic coating and a polyester pacifying film. The film and coating provide spandrel glass color and safety in case of breakage. Glass thickness and coatings of monolithic spandrel glass vary with the application. A spandrel area may also be enclosed with an IGU to provide uniform color matching of the vision and spandrel. Architect or designers usually specify IGUs for the vision area. The units may be as simple as double glazed clear float glass with a metal spacer and double seal. The edge or one surface of the IGU may be coated with a low E material, it may be gas filled with argon and equipped with a super spacer for increased R value. The type of units, its purpose and performance requirements should be discussed with the glass supplier. Check window and door manufacturers association for info. ,also check center for windows & cladding technology for further details. Glass usually does not break without a reason. Projectiles, contact with metal at the edge, excessive torque of pressure plates, high wind load, earthquake load and differential heating are some reasons for breakage. When the outer pane or the inner pane of an IGU breaks, it is sometimes referred to as thermal breakage. Glass curtain wall breakage of this type occurs when the temperature of the center of the glass rises above the temperature of the edges (sometimes caused by deep shading) by 30 degree C or more. Heat strengthened and tempered glass does not break when subjected to a temperature difference of 30 degree C.
While glass breakage may occur occasionally, the most frequent cause of failure of an IGU is moisture. When the bottom edge of an IGU is immersed in water for an extended period of time, the water attacks the seals and finally allows glazing cavity air to leak in to the IGU cavity space, eventually fogging or streaking the surfaces between the glass panes. When this occurs there is no recourse except to replace the IGU. The most frequent causes of excessive wetness are the absence of a drained and vented cavity and/or excessive amounts of sealant in the glazing cavities which block drainage paths to the outside.